CAMP RUPERTO K KANGLEON, Palo, Leyte, Jan 11 (PIA) –- Two hundred police officers from different police units in Eastern Visayas started training in the PNP Special Counter Insurgency Operation Unit Training (SCOUT)on January 10; this will go on for 45 days. 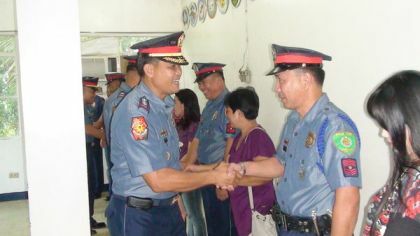 PSupt. Raymund Graveles, training commander, said the training aims to strengthen the police force by to enhancing their skills and knowledge in all aspects of police work with the end goal of attaining improved credibility of the PNP. Police Senior Superintendent Edgar O. Basbas, deputy regional director for Operations and keynote speaker, underscored the intensified role of the PNP in the anti-insurgency campaign, and the corresponding need to further enhance the PNP’s Internal Security Operations (ISO) capability. Executive Order 546 provides that the PNP shall undertake active support to the AFP in Internal Security Operations (ISO) for the suppression of insurgency and other serious threats to national security, Basbas said. He exhorted the trainees to always uphold the rule of law and respect for human rights as they transform themselves into professional internal security specialists. He also encouraged them to make the most out of the special training, participate in all undertakings, and make a genuine effort to improve themselves. “I urge you to take the training seriously because this is a rare opportunity; not all members of the police forces are given the chance to undergo such kind of training,” Basbas said. Aside from the basic skills and knowledge enhancement, the trainees will also be trained on combat operations. They must learn the rigidity of combat operations be able to fight insurgency as well as criminality. The training also teaches tactics and strategies in warfare and intelligence work in order to increase the rate of crime solution and consequently improve the image of the PNP.